As a donor, the behind the scene activity at a nonprofit might feel mysterious. Here is the great news: It doesn’t have to be that way! It’s why we are going to share a few things that nonprofits wish their donors knew – and donors will be happy to hear, as well. Nonprofits enjoy getting to know their donors and find out what it is that inspires them. Here are some powerful ways to establish such relationships, which benefit the donor, nonprofit and cause. Schedule a meeting with the nonprofit team members, tour the facility or meet with the people the program has served. Doing this throughout the year enables you to stay updated on the nonprofit’s’ progress and get any questions answered. This also lets you see how your donation is creating an impact. Nonprofits Want to Hear From You. Like any relationship, communication between donors and nonprofits should go both ways. Will you be abroad during the nonprofit’s annual fundraiser but desire getting involved later in the year? Did the latest mailing incorrectly spell your spouse’s name? Do you feel there’s some information missing from the nonprofit’s website? Let the nonprofit know; they will be happy to receive feedback and benefit from it. Nonprofits Take Their Financials Very Seriously. Nonprofits typically have tight budgets and are very serious about their financial strategies and budgeting accordingly. By trusting a vetted nonprofit and making a donation to general operations, the nonprofit is able to address needs by priority and use the funding to grow and expand programs’ impact best. Quality Leadership is Worth the Investment. To make sure that a nonprofit run efficiently, the organization needs talented leadership. To remain competitive enough with for-profit businesses, nonprofits need to competitively compensate their staff in correlation with the skills, talents, and experiences they have to offer. Providing fair and competitive compensation enables the nonprofit to have great talent and effective leadership that will drive the mission forward. Know Where Your Donations Go. If you have any concerns about how your donation is going to be spent, we encourage you to speak with the nonprofit’s Executive Director or Development Officer. Their goal is for you to be informed and confident in your donations, so they’ll be happy to have a conversation. When you walk through their goals and strategies, it will help everyone feel comfortable and better understand the reasoning – which may be different from year to year based on one-time costs, new programs, etc. – which should all be a part of this conversation. Nonprofits Have Needs All Year Long. A large portion of giving is at the end of the year. However, most people don’t realize that many nonprofits have different fiscal years. Some are at the end of December, while other fiscal years end in June or early fall. If it works for your giving strategy, consider offering support throughout the year. A greater number of nonprofits are starting to offer monthly giving options, which let donors automatically contribute on a monthly basis. Reach out to the nonprofit directly, too; they will be happy to share ways that can best support their organization and cause. Find out more about this at our blog: Philanthropy 365 Days a Year. Nonprofits can always benefit from monetary donations, of course, but this type of giving is not the only way to provide support. Volunteer Time Can Be Priceless. 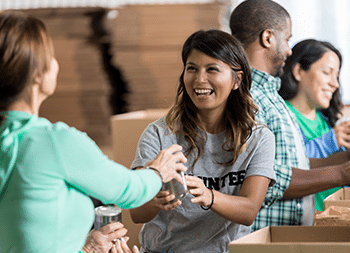 There are many nonprofits that rely on passionate volunteers. Consistent volunteering can be the factor that makes all the difference. Here are a few examples: An education-based nonprofit has weekly volunteer tutors who help students with homework. A nonprofit may want a logo redesign but lack the funds for a graphic designer. Do you possess the needed skills that you could share? Needs Are Often Listed on the Website. It is typical for nonprofits to post needed items of and/or current volunteer opportunities at their website. This is a simple strategy to discover if there’s an ideal opportunity for you. Nonprofits understand that donors are the people who empower their organizations to run and drive their missions forward. They really appreciate that you care enough to take the action that makes a difference. They notice and have deep gratitude for the impact you make. If you have any more questions about nonprofits, how they work or how to choose the right one to contribute to, reach out to our team at the Rancho Santa Fe Foundation. We’d love to help!